Additional property statuses can be created depending on need and preference. 1. From the Admin tab, click on the Statuses sub tab at left. A series of tabs will appear at the top of the screen to the right, as shown below. Click the Property tab. 3. From the Asset Type drop-down box, indicate which type of asset could be assigned this status. 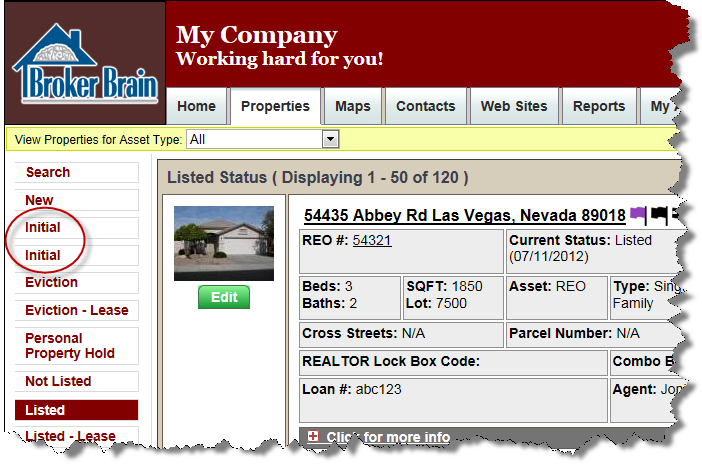 If you want this status to be available for all types of properties, select All. 4. Select the desired weight of the item from the Weight drop-down box. The status weight controls the sorting order of each status in menus where they can be selected. The lower the number, the higher the item will appear on the list. 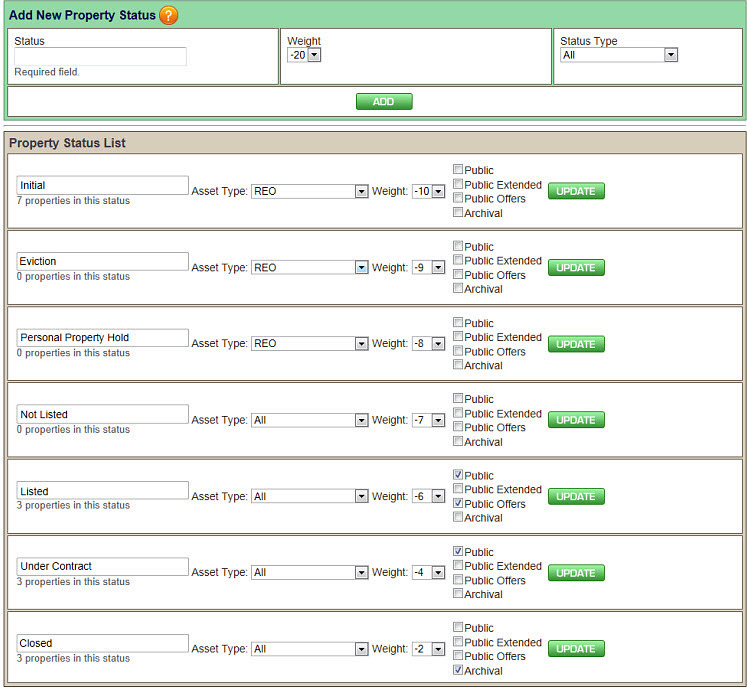 Before you set a weight, review the current statuses beneath the Property Status List bar. These are the current property statuses and are listed in order by weight. Public Offers - This enables any property in that status to have an offer submitted from a public setting. This is only the case if you have globally allowed public offers in your Site Settings. See Allowing Public Offers for more information on this feature. Public Extended - Checking the Public Extended box indicates that this status is considered public extended. Archival - The archival option allows you to designate statuses that will not count towards your price plan quota. Any property in an archival status will have very limited editing capabilities. You can move properties in and out of archival status at any time, as long as your pricing plan allows for that number of properties to be open. If you are currently at your price plan quota, the system will not allow you to remove any properties from an archival status. (Notice that the Closed status is defaulted with the Archival option. This can be changed, if desired.) Note: For a complete list of what can and connot be done with an archived property, see Archived Property Capabilities. 6. Click the green Add button. The new status will be added to the current status list. If you have a property in a status that is viewable on the public site but should not appear for public view, you can remove it from public view by following the instructions provided here.